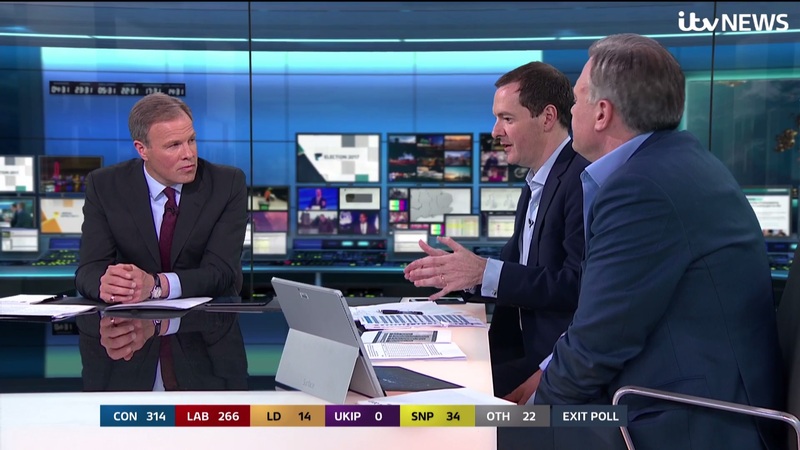 ITV has won plaudits for its election night coverage, which included analysis from Evening Standard editor George Osborne, despite losing the battle for viewers to the BBC. The BBC claimed the most viewers for its election night coverage, once again led by David Dimbleby, with an average of 4.4m viewers and a 39 per cent audience share between 10pm and 2am. ITV’s said its coverage was seen by an average of 1.1m viewers in the same time slot, a share of 9 per cent of the audience, while Channel 4’s Alternative Election Night, led by Jeremy Paxman, rated 582,000 viewers and an audience share of 5 per cent. Despite its relatively small audience share, ITV was broadly praised by viewers on Twitter, including a number of journalists, and critics. Press Gazette understands Tom Bradby, who led ITV’s coverage, did not have a single break across eight hours of results coverage. Curtis described him as having a “preternatural springiness”. He added of the programme: “Bradby seemed to get the most interesting collections of newspaper columnists and former special advisers and spin doctors. Standard editor Osborne had been due to leave at 3am to go and edit the paper but stayed until the very end at 6am, Press Gazette understands. ITV News national editor Allegra Stratton, who gave birth three weeks ago, had scheduled breaks with her baby daughter while working. The broadcaster’s line up of Osborne and former Labour Shadow Chancellor Ed Balls received particular praise. Guardian political sketch writer John Crace said Osborne had a “definite sparkle in his eye” as a studio guest.